Schultz Creek Trail parallels one of several intermittent drainages that carry water from the higher reaches of the San Francisco Peaks. Generally the stream only has water in it a few months of every year, either during the spring snow melt or after a summer monsoon. However, even when there is no water here, which is most of the time, walking beside the water-smoothed stones and ledges worn by ephemeral waterfalls can still give one the pleasant feeling of being near a brook even if you have to imagine the babble. 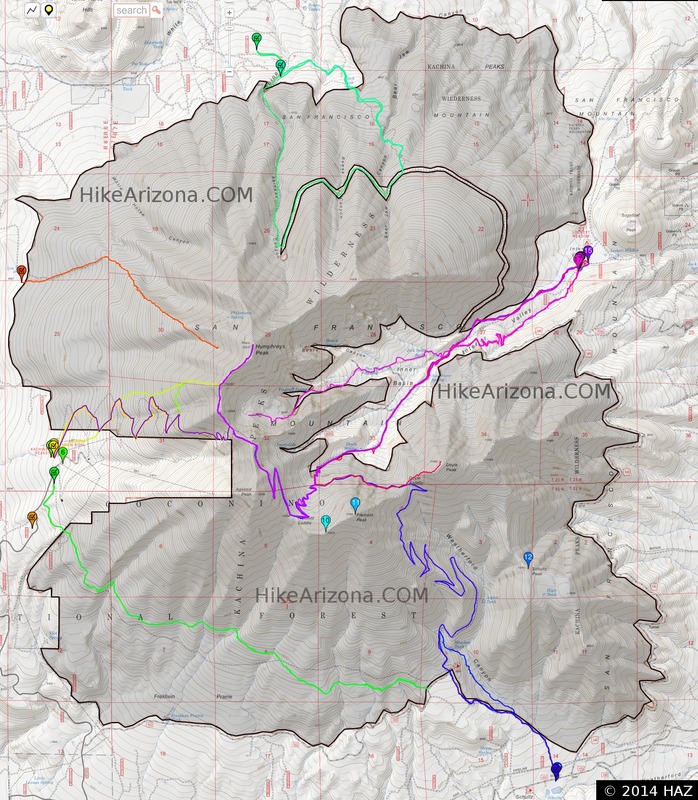 This trail has one of the most moderate gradients on any in the San Francisco Peaks/ Mt. Elden Area. Still, it has enough ups and downs to be extremely popular with mountain bikers and off-road motorcyclists, both of whom it is open to. So, if you come for a hike or a horseback ride, keep your ears and eyes open and be ready to share the trail with users of all sorts. If you hike this trail during a quiet time, Abert's squirrels and Steller's jays are animals you might see here. During late spring and early summer this is a good place to hear the musical trill of the hermit thrush. Schultz Creek Trail serves as a connecting trail between Rocky Ridge and the Sunset trails. Access: Drive north from Flagstaff 2 miles on US 180 to FR 420 (Schultz Pass Road). Turn east and follow FR 420 about a mile to a gate and cattle guard. Turn right down over the hill toward Schultz Creek and park. The trailhead is at the north end of the parking area.